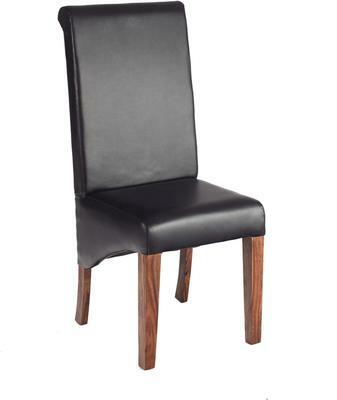 This dining room chair has a modern appearance that immediately catches your eye. The front two legs are bare. However, the back two legs are half covered with a black upholstery. This adds a really unique design element to the chair. It's bound to be something guests bring up at your next dinner party. The back of the chair has a slight backwards curve in it. This makes it more comfortable to lean against. The entire back is also covered in upholstery. The seat of the chair is also upholstered and its design will make it comfortable to sit on for long periods of time. This unique chair will be an exciting addition to any room of your home. Width: 45 cm. Depth: 52 cm. Height: 107 cm. This item is sold and dispatched directly by Verty furniture.